Matcha Market size was over USD 2.5 billion in 2017 and industry expects consumption of above 190 kilo tons by 2024. Rising awareness for healthy lifestyle owing to growing chronic diseases including cancer, obesity, heart diseases, and diabetes will drive global market size. It is high in antioxidants, vitamins & minerals, epigallocatechin gallate (ECGc), and fibers which helps in weight reductions and increases metabolism. Growing functional foods demand and incorporating the product in them would boost product demand. Matcha powder is derived from Camellia sinensis which is cultivated in Japan and China owing to its soil and climatic conditions. Tea leaves used to produce it are shade grown & unfermented to stop oxidization in tea leaves to maintain their green texture and increase chlorophyll in them. The product has increasing application scope in food & beverage industry and personal care & cosmetics. Global tea market size is anticipated to surpass USD 55 billion by 2024. Tea is most common beverage consumed globally owing to presence of various nutrients including amino acids, polyphenols, and less caffeine than coffee. Matcha powder is replacing black tea as a regular beverage in India, China, Australia and South Korea owing to shifting consumer preference for healthy beverages. Indulgence in healthy practices including yoga and meditation would also boost product demand as it relaxes mind and boosts memory & concentration. Rising disposable income allows consumers to spend more on premium organic products to enhance their lifestyle. Canada, U.S., Germany, France, and UK are major consumer countries. They utilize it in lattes, smoothies, ice creams, and bakery products including cookies & pastries for its texture and taste. Increasing matcha powder demand in food, beverages and personal care & cosmetic industries will further propel the market growth. Tea leaves are the only essential raw material for producing matcha tea powder, but labour and transportation plays a vital role as well in the process. Japan has stringent government policies pertaining to soil fertility, fertilizers, pesticides, and grading. Premium plucking process, production process including steaming, cooling & drying, and grinding on stone mill attributes to high product powder market price. Unfavourable climatic conditions and change in government policies of Japan and China also hamper industry profitability, thus affecting price trends. Matcha market size from steamed technology expects over 5.5% gains in the projected timeframe. Japanese prefer steaming the tea leaves to stop oxidation. Production starts from cultivation of tea leaves. Tea leaves start to bloom from April and after 20 days they are covered to block sunlight to enhance chlorophyll component in the leaves. Matcha market from pan fried technology anticipates 6.5% gains by 2024. Tea leaves are hand plucked and delivered to processing factory and then pan fried. Loose leaves are then passed through multichambered air machinery where they are blown and cooled utilizing mild air flow. Before grinding stems and veins are separated from tea leaves. Tea leaves are grounded using large granite stone mill to obtain perfect tea powder consistency. Matcha market size from classic grade will surpass 80 kilo tons by 2024. Classic grade is primarily utilized for brewing beverages. This has led to high demand from European market owing to its usage in treating obesity and beverage innovation. Shifting market trends for organic food & beverages would propel industry growth. Matcha market size from culinary grade expects 5.5% gains by 2024. Culinary grade is often used in baking and cooking to provide a distinct flavour. Global bakery market was valued at USD 2.5 billion in 2017 and expects to grow at 5.5%. Increasing disposable income of consumers is rising demand for instant snacks leading to increasing bakery production. Growing preference for organic baking ingredients will positively influence product consumption and boost market size. 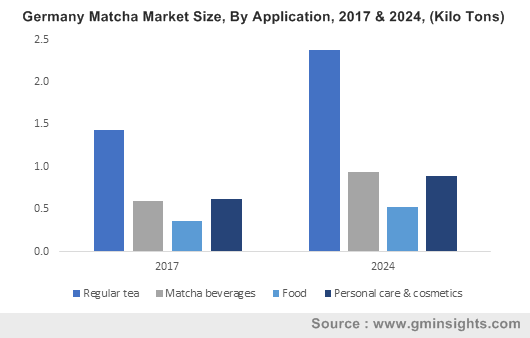 Matcha market from food applications will surpass USD 450 million during projected timeframe owing to changing consumer demand for organic food products. Global food colour market expects gains at over 6.5% in projected timeframe. Increasing health benefits from product is attracting its application in flavouring, aroma, and baking industries. Its demand is anticipated to rise as it helps to reduce risks for type 2 diabetes, cancer, and anxiety. Matcha market from personal care & cosmetic application will witness 3.5% gains over the projected timeframe. Global organic personal care market was valued at 12.5 billion in 2017 and is anticipated to grow at 7%. The product is used in personal care products owing to its anti-inflammatory qualities for treating acne, blemishes and detoxifying skin from free radicals. Shifting preference for organic face masks, toner, moistures, and face serums would propel product demand. Asia Pacific led by Japan and China market size is projected to surpass USD 1.5 billion in the estimated timeframe owing to its growing application in food industry for its texture and taste. Cultivation is being supported due to its geographical regions and soil quality making them hub of outsourcing. China is leading manufacturer and exporter of matcha tea powder owing to less government regulations. North America driven by Mexico, Canada and U.S. market may observe significant gains up to 6.0%. Increasing food innovations utilizing the product owing to consumer inclination for heathy lifestyles and organic food product may fuel regional product demand. Presence of food chains including Starbucks, Kwality walls would have positive industry growth. Europe led by Germany, Italy, UK, and France market size may witness significant gains of 6.0% over the projected timeframe. Rising consumer preference for organic personal care products owing to their production process of not using harmful chemicals and pesticides. This reduces risk of skin damage, redness, irritation and skin burns from harmful chemicals. 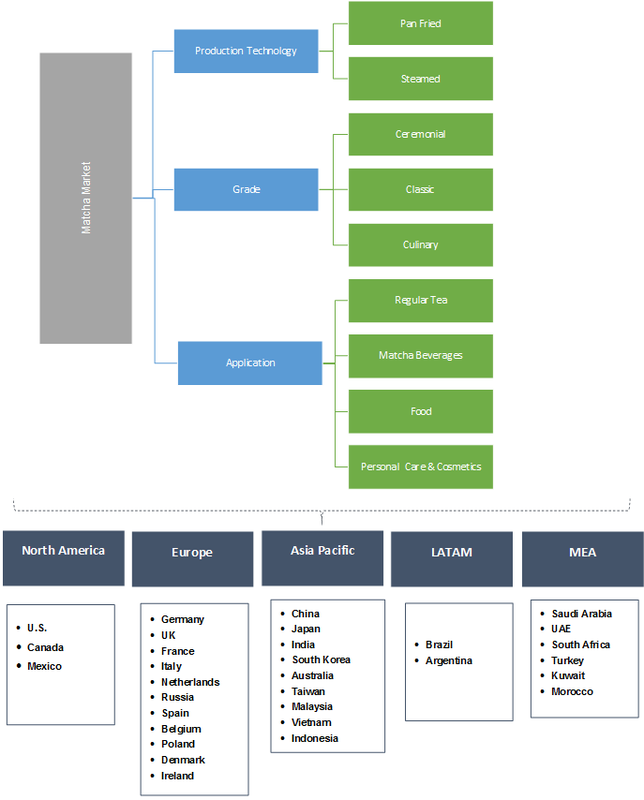 Global market share is highly competitive and moderately fragmented with key industry participants including ITO EN, Aoi Tea Company, Encha, Vivid Vitality, AIYA, and Ippodo Tea. Companies are investing heavily in R&D activities to develop new products, capture higher market share and retain their existing consumer base. Manufacturers are expanding their regional presence in Japan and China to make sourcing easy for raw material. Companies are launching campaigns to get consumer engagement in their product by organizing workshops and seminars for its health benefits. Recently Starbucks launched new beverages incorporating it to increase their nutrient content. Kwality Walls has launched matcha ice-creams to cater demands of health-conscious consumers. Matcha tea powder is cultivated in China and Japan. It is made through shade grown tea leaves containing vitamins, EGCG, and essential nutrients to keep mind alert, calm, and boosts metabolism. It comprises of unique, potent class of antioxidant identified as catechins. The product demand is driven mainly for its health benefits of flushing out toxins from body. The product is expensive due to its production process. Stringent government regulation, premium hand plucking process, and large-scale grinding process contributes in making it a premium product.